Appian Way first hired The Orphan scribe David Leslie Johnson to pen a modern gothic re-visioning of the classic Grimm fairytale back in August of last year. Soon after Twilight director Catherine Hardwicke was attached to the project being developed through Warner Brothers and Appian Way. Since then the project has been mum. Yesterday the Los Angeles Times ran an article that reveals some disturbing news about the gothic re-visioning of Red Riding Hood. My worst fears surrounding this project are realized. The L.A. Times confirms that WB is trying to take a Twilight spin on the classic tale. The paper describes the David Leslie Johnson script as, "an update of Little Red Riding Hood, with the requisite dark/dangerous/romantic elements that can appeal to "Twilight" fans -- while also attracting audiences who simply like the fairy tale." The Big Bad Wolf is going to romantically woo Little Red Riding Hood? Deep sadness comes in typing those words. I had longed for a gritty and brutal account of the classic Grimm tale, but instead were getting more romantic dribble. My negativity towards this re-visioning is ironic, considering I have become a big fan of the Twilight films, but I stand firm that a dark and dangerous Red Riding Hood would be far more enjoyable than one trying to re-brand what Twilight has already done with romanticism. 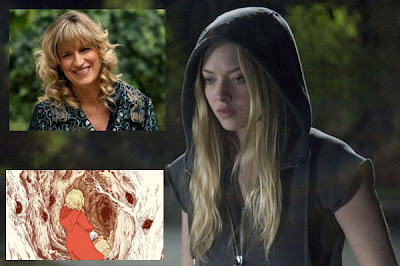 The L.A. Times also points out that director Catherine Hardwicke and Warner Brothers are eyeing Amanda Seyfried for the lead role in the "dark/dangerous/romantic" Red Riding Hood adaptation. Seyfried who recently co-starred with Channing Tatum in "Dear John" seems like a nice choice for the lead role, although she doesn't necessarily get me excited. After Dear John showed box office success, it is not surprising that Warner Bros. are targeting Seyfried, who could still be had for relatively cheap money.